This is easy to prepare as I used store bought gnocchi and only had to focus on the veggies. 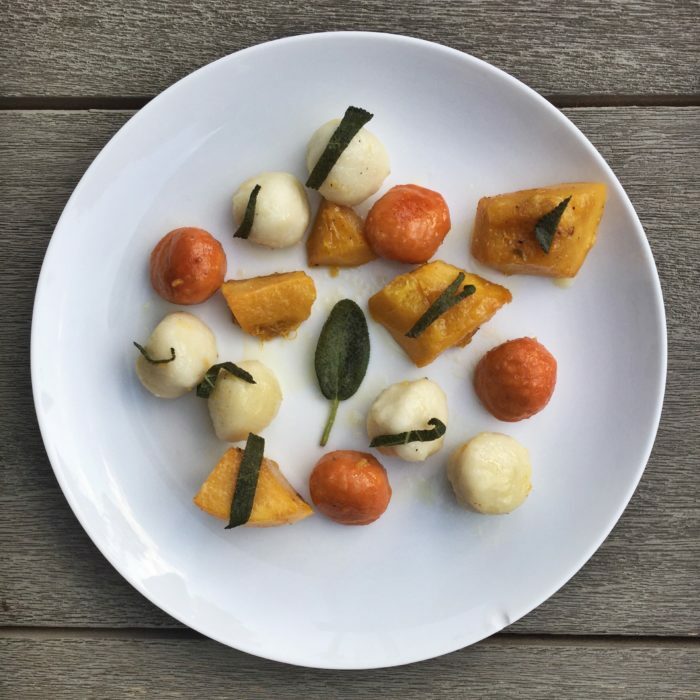 I got both regular potatoes and sweet potatoes gnocchi, I thought it would make a more flavorful and interesting dish! Once fall arrives, I want to eat pumpkin kind of dish all the time (plus my kids loooooove it) so I added baked acorn squash to make it a complete dish. Preheat your oven at 450F. Place the cut veggies on a baking sheet. Drizzle with olive oil, 1 tsp of salt and 1/2 tsp of pepper. Place a few leaves of sage around to add flavor. Bake for 20 minutes until the veggies are tender. Meanwhile bring some water to boil and cook the gnocchi according to the package instructions. Once the veggies are cooked, heat up some olive oil in pan and add 5 chopped sage leaves and let it barely cook on low heat for a couple of minutes, add the cooked veggies and mix well together. Taste and add more salt and pepper if necessary. Toss in the gnocchi for 1 more minute. Add some parmesan and serve. I really enjoyed the combination of flavors of this dish! Goes well with the season.